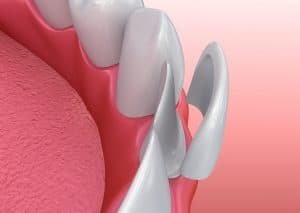 Porcelain veneers are thin, tooth coloured porcelain shells that are custom made to bond to the front surface of teeth. As the name suggests they are placed over the existing teeth to create a layer over the existing tooth to enhance its appearance. Porcelain veneers are excellent for treating chipped, discoloured or misshaped teeth, especially in front teeth. They are often the ideal option for improving shape, length, size and tooth colour. The colour is matched to the surrounding teeth so the new surface blends into the existing smile. Porcelain veneers are a more conservative option than a crown as it requires less preparation of the tooth. 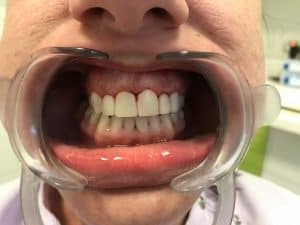 The key difference between a crown and a veneer is that for a veneer to be fitted the underlying tooth has to be strong and healthy. If the tooth is heavily filled or decayed there is nothing stable for the veneer to bind to. Generally in these cases a crown is the better option. The popularity of porcelain veneers is continually escalating. This is due to their ability to enhance both the functional and aesthetic nature of your smile. 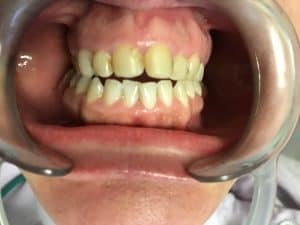 This patient had had some dental veneers placed by another dentist some years ago. 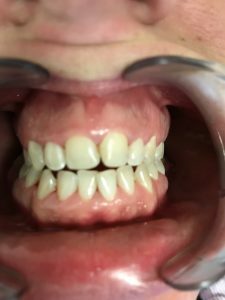 She was not happy with the treatment so Dr Jowitt removed the veneers and gave her a new smile. This photo shows the condition of the existing veneers. They are yellowing and do not give an even shape to the teeth. 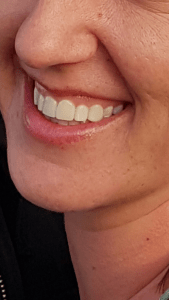 This photo shows the condition of the teeth after the veneers were removed. The new veneers are placed but need time to settled into the patient’s mouth. After 3-4 weeks the mouth has competely healed and the veneers have settled into place. The patient now has a smile to be happy about. If you would like to discuss this type of treatment please contact us to make an appointment.